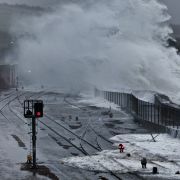 A vast multitude of people came into Penzance on Wednesday last, from the surrounding populous district, and from all parts of West Cornwall. The first train that came down from Redruth was a monster one for the West Cornwall Railway. It was propelled by three engines, and had forty open wagons crammed with passengers as closely as they could ride in them. The train arrived in safety, but about an hour after its usual time. A train left Penzance for Truro in the morning, to convey some of the directors to that town, where a board meeting was held, and about twelve o’clock the chairman and directors of the company, and gentlemen connected with the Cornwall Company left Truro for Penzance. 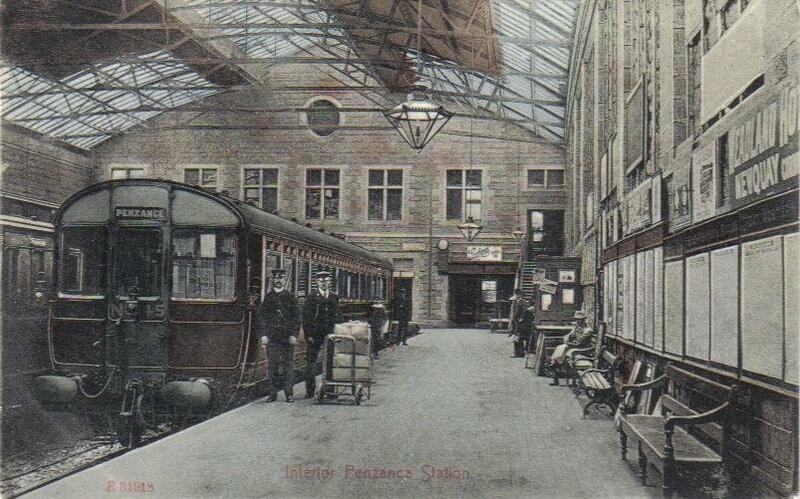 At Camborne they were detained for a long time waiting for three up trains to pass; and consequently the directors, who were expected at Penzance at half-past one o’clock, did not arrive until more than an hour afterwards. At the Camborne Station, the train passed under a very prettily decorated triumphal arch; its progress from Hayle to Penzance was at a rapid speed, and its arrival at the latter station was signalled by the firing of a cannon. The streets of Penzance were by this time crowded with thousands of people. Such numbers were never seen in the town before as assembled on this occasion to witness the demonstration and festivities on the opening of the West Cornwall Railway. The inhabitants showed their public spirit by uniting most heartily together, and the display they made to welcome the event was such as was never before produced in any other town in Cornwall. A profusion of ever¬green arches was erected, the very number of which renders it impossible to particularize the whole. These were decorated with flowers, and mounted with flags and banners, and inscribed with various mottos, such as “Success to the West Cornwall Railway” and other inscriptions. (From the ‘West Briton’ 27th August 1852). The ‘West Briton’ report shows that the people of Penzance were very pleased to see the opening of the West Cornwall Railway in the town. It was a great event for Penzance and everyone there knew that they were seeing something extremely important, for it marked the beginning of a whole new age in the area; a time of great change. Although the railway had now come to Penzance, passengers could still not travel beyond Truro because the ‘Cornwall Railway’ running from Plymouth to Truro, with its tremendous bridge over the Tamar, was incomplete. Isambard Kingdom Brunel the famous engineer of the Great Western Railway was in charge of this work and it was completed in May 1859. From then onwards it was possible to travel from Penzance to London but not without changing trains at Truro. The Cornwall Railway and the route to London was built to the broad gauge of 7 feet and ¼ inch, but the standard or narrow gauge from Truro to Penzance was 4feet 8½ inches. This was changed in 1866/67 when the broad gauge was built to Penzance, whilst keeping the standard gauge also. Journey time by fast train to London was 12 hours and was far quicker than stage-coaches or steam-ship could hope to travel. The first station at Penzance was a small wooden building with an overall roof and was tiny by comparison with the present day station. Railings still in place along the station wall mark the length and position of this first building, which barely reached the full height of the wall. 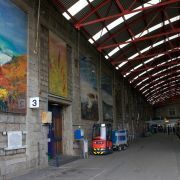 In 1879-1880 the present granite-built station was opened. It cost £16,000 to construct and whilst building was in progress the lower end of Market Jew Street was widened and improved. Trains arriving at Penzance had to run along the seashore from Marazion and finally cross a low wooden viaduct 350 yards long at Ponsandane. 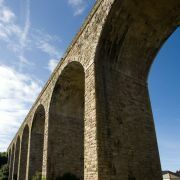 This viaduct was built on the beach itself and was very often attacked by rough seas and gale especially during the winter. 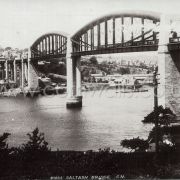 During particularly bad weather the viaduct was closed to trains and was frequently damaged. In January l869 it was destroyed in a very fierce storm. 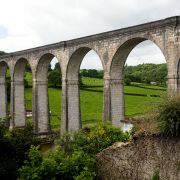 Another viaduct replaced it, but this was removed in 1921 when the present stone embankment protected by large granite boulders was built. The arrival of the railway at Penzance did a great deal for the fishing industry and agriculture. From the beginning of services to other parts of the country large amounts of fish and vegetables were sent away by train. The important markets were London, the Midlands and the North Country, and the railway with its fast trains could deliver this produce quickly while it was fresh. In June 1871 ‘The West Briton’ described the scene at Penzance. The Great Western Railway spent large amounts of money on books posters and general information to advertise Penzance as an important holiday resort. Cornwall became known as ‘The Cornish Riviera’ with the G.W.R. doing all it could to show Penzance as a special place not just an ordinary holiday town. In posters and prints, St Michaels Mount, Mounts Bay, Lands End, Mousehole, the beaches cliffs gardens and palm trees were all intended to make West Cornwall different from other places. ‘The Cornish Riviera Express’ began running to and from London in 1904 and became one of the most famous trains in Britain. Penzance promenade was opened one year before Courtney wrote his guide to the town, and it was soon described as the finest sea front in the West of England. The promenade attracted many people because of its excellent position, and hotels, baths, gardens, bandstand and a theatre were gradually built along it. ‘The number of visitors to Penzance and its neighbourhood this season has been altogether unpre¬cedented. It has been stated that if Mr. Blackwell’s large hotel now building on the Western Green had been completed, it would have been more than filled and Mr. Norton has been obliged to add several rooms to the baths which command such beautiful views of Mounts Bay, Newlyn etc. Mrs. S.P. Jackson the well known water colour painter, and other artists, have been sketching in the neighbourhood of the Logan Rock for the last week or two, and it is stated that since the opening of the Cornwall Railway, many pictures of scenes in Cornwall have been exhibited. The tin bearing ore was first stamped (broken down into very small pieces) by simple hammering machinery worked by a waterwheel, then it was put into the furnace and mixed with culm (shale or fire coal) to produce a white hot metal and all the impurities with it, called slag. The metal was then re-heated to draw out the slag and was eventually transferred into a large cauldron or container to be kept boiling. Green apple-wood in the cauldron acted to force the slag or the impurities to rise to the surface where it could be drawn off. The tin was then poured into mould to cool as bars of pure metal that could weigh up to 320 lbs each. Tin was a very valuable metal and was stored very carefully in secure buildings at the works with barred windows and heavy door locks. The tin storage area can still been seen today, marked by the barred windows. Chyandour smelting works was owned throughout the last century by the Bolitho family, whose great house was built nearby overlooking Mounts Bay. The works remained in production until 1912 and the main building was eventually demolished. Today nothing remains of the actual smelter except the store walls at the rear, and a coal yard now occupies the main site. Other buildings linked with the works can still be seen. Many of the houses at Chyandour were originally the homes of smelting workers and the large stables with their grand entrance and clock—tower, the various workshops and the memorial horse—trough are all in good condition. Corner buildings along the roadside have cut—away sections that enabled the loaded carts to pass without to much difficulty to and from the works, and the Coombe river was especially banked and directed to supply water to the smelter. All these features indicate the former presence of an import ant industry. Chyandour was not the only smelting works in the Penzance area. There was another at Trereife, by the river in Newlyn Coombe, perhaps better known as Stable Hobba. These works, also important during the last century, closed in 1896. In 1848 the Government passed the first Public Health Act which was meant to deal with some of the worst problems of living conditions in the towns and cities. The killer disease, cholera, had brought terror, suffering and death particularly to the poor, so it was necessary to act to make the towns cleaner and healthier. It had always been the task of each town or city to look after its own people and the conditions in which they had to live. Many places, however, did litt1e or nothing to improve health but some councils did; conditions varied from one town to another according to the interest shown by the town councils. The Government was forced to take a part in health matters by 1848 to make sure that the people in the very worst towns had some protection. Penzance applied for a health inspector to make a report on the town in September 1848 and was one of the first towns to do so. The inspector for Penzance was Mr. George Clark who drew up his report dated February 20th 1849. Here are some of the details from the report. St Clare Street - though high it is not drained and from it a number of small houses are arranged in courts, chiefly on the east side. In many cases the ground rises behind the houses and drains upon them. The courts are small, close, unpaved or badly pitch paved, in holes without drains, but with an irregular gutter about a yard from the back of each house. This commences high up, receives the overflow of the cesspool and privies of each house, and being full of hollows forms a number of stagnant offensive pools close to each door and window. In the yard of each tenement is a privy, usually in a bad state, both of repair and cleanliness. On one side of it is an open cesspool which receives its contents and all the filth of the tenements of every kind. This description applies more or less, and usually very closely, to St Clare Terrace, Pendarves Row and the quarter of the town about St Clare Street and above the Fountain Inn. At the back of these districts the alleys leading to the backs of the premises are narrow and unpaved and quite impassable, being used by people as public necessaries. The Battery - In t he older and more densely peopled parts of the town near the Battery bathing p1ace, quay and pier the state of things is somewhat different. Here, owing to the want of space, many of the tenements have privies and often cesspools under the roof of the dwelling house. In other cases, the filth from an upper storey is discarded by an open shoot into the court or passage below. Others are absolutely without a convenience of any kind and discharge their filth from time to time direct into the street or over the wall into the harbour above tide level. Though close to shore, this quarter of the town is so intricately arranged that very little of the sea breeze finds its way into the courts. It is impossible in words to convey an adequate idea of the filth of this quarter in which the cholera prevailed formerly, and from which epidemics or diseases of the bowels are rarely absent. The Eastern side of town - No advantage has been taken to secure anything like drainage... (the natural slope of the land here to the sea would help with drainage)… there are the open cesspools and rumous or ill-constructed privies… The north and south sides of Adelaide, Camberwell and Penwith Streets may be cited as very bad indeed. Paving - The main streets are either paved or Macadamised, chiefly the latter; the principal footpaths are almost all flagged with granite slabs. In the smaller streets the paving is very deficient indeed. The narrow lanes behind rows of houses are not paved at all and many of them are in the wet seasons impassable. Sewers -“There are, in fact, no sewers in Penzance; no sewer rate is levied. There is no house drainage in Penzance. Water Supply -Penzance depends for its water supply upon 53 private wells and pumps and six public pumps of which at the time of my visit as a wet season and day, four were out of order and yielded no water. There are also six public spouts fed by pipes from the reservoir (now sealed beneath the present road at the top of Causeway Head) constructed in 1759 and amended in 1797. The report described the reservoir as “ an open brick basin walled in and holding 11,331 gallons.” It was fed by three streams flowing into one below Madron. The water was brought to the reservoir over the last 1¼ miles by an open and a partly covered channel that was built for this purpose. It was also stated that in the dry season when water was very scarce, carts were used to carry supplies from Alverton Brook at Larrigan to the town. Here the water was sold at a farthing ¼ d and a halfpenny ½ d for a hand pitcher. Once the report had been made, Penzance formed its local Board of Health to take charge of lighting, paving, sewers and water supply. Over the next ten years a great deal of work was carried out on the improvement of water supplies with new reservoirs near Heamoor and a system of sewers and drains for the town. This work made a great difference to living conditions and health in Penzance. Soon after the end of the First World War (1914-1918) towns and cities throughout Great Britain began to plan and build council estates to provide additional housing for the population and to replace older slum buildings that had become unfit to live in. In the larger cities like London, Manchester or Birmingham vast council estates appeared by the 1930s, and in Penzance this type of housing was developed at Penalverne (1931) , Treneere (1938) and, after the Second World War (1939-1945), Alverton in 1949. The type of housing that was provided and the way in which it was arranged was new. It was also important that the way in which the estates were first developed and looked after was new. They were organised and owned by the local council who provided the houses for people at rents that they could afford without costing too much for those with low wages. This meant that the chance to live in a well built house was something that anyone could now enjoy as long as enough could be built. 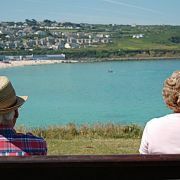 The council estates brought great changes to the appearance of the town and to the living conditions of the people who moved there, and for these reasons the estates have an important part in the overall history of Penzance as a town. Treneere Estate dates from 1938, and was built on the edge of the town on a site that had been fields and open land.